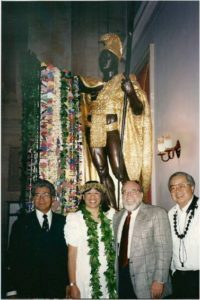 On June 8, 1997, I led the Kamehameha Schools Alumni Chorale during the Kamehameha Day ceremony honoring Hawaii’s first king in Washington, D.C. Our group sang “Hole Waimea” about the place on the Big Island of Hawaii where Kamehameha grew up and “Nā Ali’i about the chiefs and their famous sayings. My husband and I also sang “Ku’u Pua I Paoakalani” while Ipolani Lung danced hula to the song written by Queen Lili’uokalani about her home in Waikīkī. Kamehameha Schools alumnus U.S. Senator Daniel Akaka from Hawaii gave a talk about the national significance of King Kamehameha who united the Hawaiian islands into one kingdom in 1810. After the program, my husband and I had the honor of taking a picture with Senator Akaka and U.S. Representative Neil Abercrombie (from Hawaii) in front of King Kamehameha’s statue draped with leis. The Kamehameha Day ceremony has been happening at our Nation’s Capitol every year since 1969 when the statue of King Kamehameha was unveiled in Statuary Hall. In 2008, the Kamehameha statue was moved to the new Visitors Center where the Kamehameha Day ceremony hosted by Hawaii State Society continues to this day. On May 30, 2018, I will be presenting a talk about Kamehameha Day as part of my Hawaiian History and Song Series on the 5th Wednesdays of the month at Kaunoa Senior Center for adults 55 and better. We will be singing a few songs about King Kamehameha and more.